I bought this fabric ages ago… back when I was pregnant with Wrenn (she’s now 18 months old), and it sat on my shelf for the longest time as I waited for the inspiration to hit me. And waited… and waited… and birthed a baby, and nursed a baby… you know, I had a lot going on. 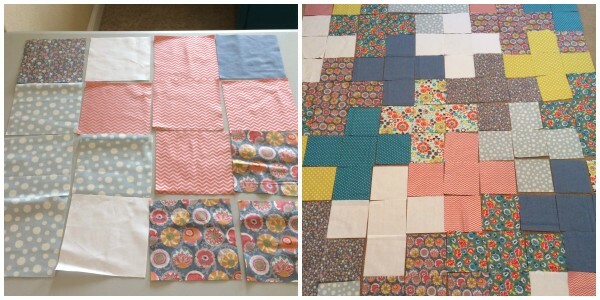 Finally, over the summer, I got inspired by this gorgeous blogpost to make my first cross quilt. 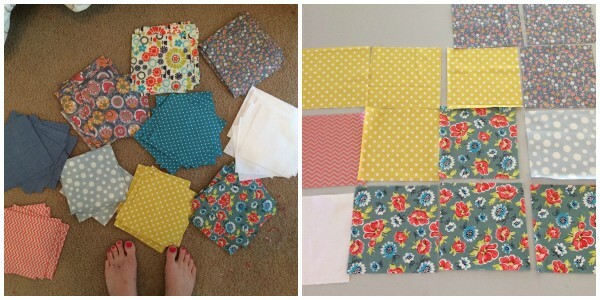 You know how much I love triangles… it was a rare treat to work with full squares for a change! The layout took almost no time. The sewing together took a little longer, seeing as everything had to be checked and double-checked so I didn’t end up with any wonky crosses. 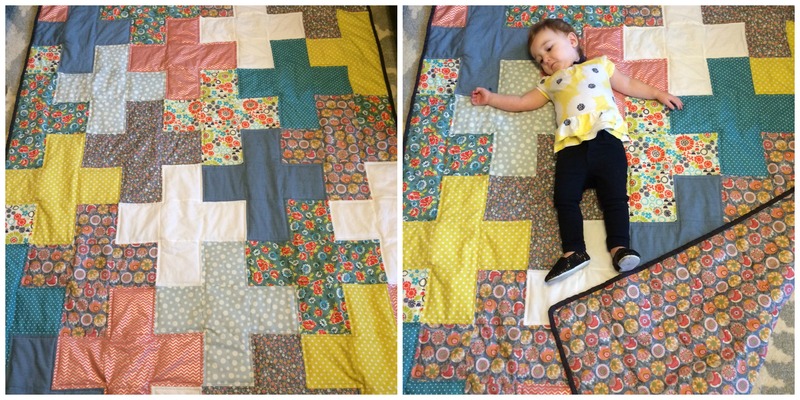 You can imagine me working on this quilt as I had a one-year-old running around, trying to touch the fabric, touch my machine, play with the cord, and LOOK AT ME MAMA! HOLD ME MAMA! I WANT A CRACKER MAMA! I’ll admit… this quilt may or may not have been created with Sesame Street playing in the background. A mama’s gotta do what a mama’s gotta do. Don’t judge. I decided to hand-bind this quilt, and I’m pretty sure that’s what caused my wrist tendonitis to flare up. Four months of wearing an immobilizing brace later, I managed to avoid surgery (for now), but I will probably not be hand-binding anymore quilts for awhile. Like, never again EVER. But man, it turned out so beautifully, it was almost worth it. Who said quilting wasn’t dangerous? The finished size is 75 x 54 inches – the perfect size for a toddler bed or a throw for some great snuggling on the couch with your honey (or baby child). It took me four months, but I was decided to part with this beauty – it’s for sale in my Etsy shop here. 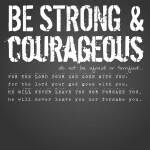 Hurry up before I change my mind and keep it for myself… because I’m tempted! P.S. – Baby not included.